This section is from the book "Plastics In The School And Home Workshop", by Andrew Jules Lockrey. Also available from Amazon: Plastics In The School And Home Workshop. Materials: 1/2 of a scalloped cyl. 1, 7/16" sq. rod, sheet scrap and handle. The ash-tray and cigarette-box shown in Fig. 40 and Plate 3U consists of a 3 1/2-inch section of scalloped cylinder for the box, a 3/4-inch section of the same size but contrasting color for the ash-tray, which has a metal insert, and a twisted plastic or chrome-plated brass rod for the handle. The cigarette-box is bottomed with a piece of 3/16-inch sheet and has a top of inch sheet of contrasting color, with a shoulder as shown. The lid-handle consists merely of a 1 1/2-inch length of 1/2-inch round rod, cut diagonally at each end and cemented together where they contact, while the twisted rod is cemented at both ends, if made of plastic, or held with drive-screws if of metal. The plastic rod can be easily bent and twisted if heated about five minutes. Fig. 40. 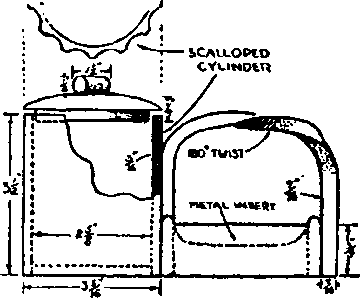 The smoker's set described in Project 29. This design is most effective whon made from the fluted cylinders. 1/4 of a 1/4" sheet; handle. The cigarette box in Plate 3Y and Figure 45 is one of the most beautiful simple projects we have seen. The morroco red-mottled top, the jet black polished cylinder, and the mysterious cloudy color of the moonglow rings make a striking combination. Many other color combinations are equally attractive. The cylinder is a piece cut and polished from a cylinder of the regular 3 -inches outside diameter, while the Moonglow rings are turned from the thicker cylinder of 3 1/2 -inches outside diameter, which has been bored out on the inside to fit the black cylinder. Such rings could also be turned out of sheets and thus be made any width or shape, in order to secure variations in the design. The base is a face-plate turning cemented inside the cylinder. Fig. 41. 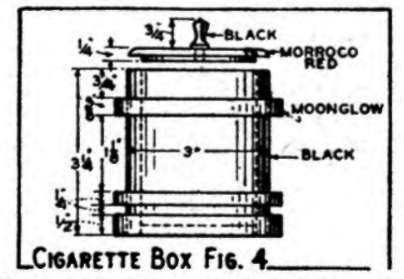 The cigarette-box described in Project 33, another popular design, requiring both boring and turning. 3x3x3/16 sheet, 4" of 1" rod. The Ash Tray in Figure 46 (upper), (which also includes two additional designs for powder-boxes), or any ash tray made of this material, presents certain difficulties, as this material, while not inflammable, will stain or turn a reddish brown, when subjected to heat. The solution is to make those parts subject to heat of a color which will hot show the stain. Either black or a dark mottled brown will serve this purpose. The body, made of Opaque Jade, is cut away at an angle where the cigarette-coal might touch it. Both the large cylinder and the round rods at the sides are flattened on a disc-sander (or by hand) where the contact is made. Fig. 46. 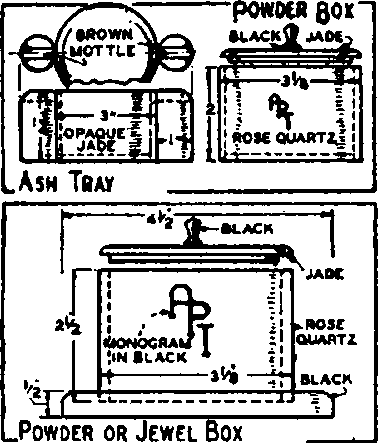 The ash-tray described in Project 34, and two designs for Jewel or powder boxes, showing "inlaid" monogram. Materials: 2 halves #2B Cyls., different colors; 6"x6" sheet; 1/2" sheet scrap; knob Here is an interesting modernistic design requiring a little lathe-work and some very careful sawing. The box consists of half a cylinder, with a piece of 3/16" sheet cemented in for a bottom, and a top turned from sheet, with a shallow shoulder turned in the lower edge fitting loosely inside the cylinder, and the usual turned knob handle. Another half-cylinder, of contrasting color is then sawed with three cuts at an angle of about 30 degrees, as indicated on the photo Plate 4C, forming two equal sections for the pair of ash-trays, and two thin strips which serve as the ornamentation on the box. These cuts must be true and paralell. These strips are cemented to the box in the position indicated, after cutting and warming them sufficiently to allow of their being opened about 1/2" so that they can be placed around the box. These openings are not filled in, but placed one above the other. The cigarette-rests, of 1/2" black sheet, are filed on top with a rat-tail file, and set into a notch filed in the piece of cylinder as indicated in Figure 29-E. The trays are bottomed with discs of 3" sheet. All parts must be polished before assembly and cementing, the portions to be joined being re-sanded.